For the beer swap this year, I had decided to build a tankard. 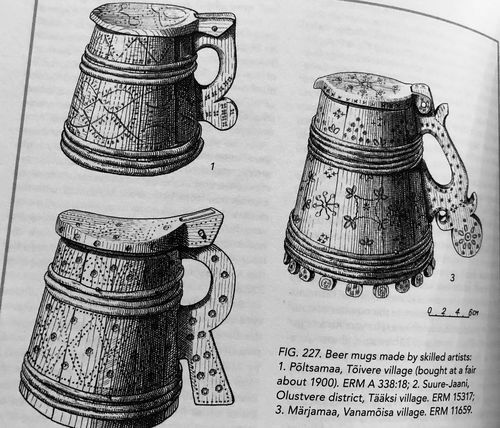 I’d seen tankards in Woodworking in Estonia and thought “how hard could it be?” That usually leads to an interesting build. I had a chunk of crab apple from a tree from my yard. It came down four years ago, and a friend had slabbed it and had been air-drying it. It was ready to go. 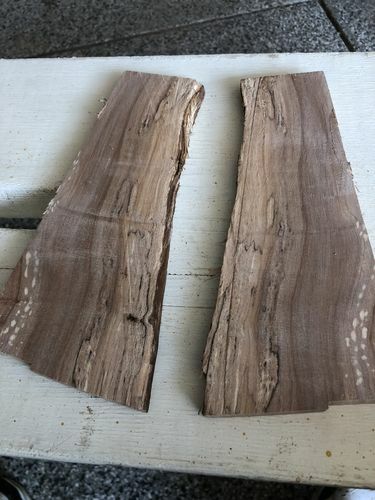 The first few cuts were a little ragged, but I soon found my rhythm, and cut off a dozen nice and fairly even pieces of apple wood. The grain in them looked pretty. Not wanting to waste the apple, I also started building a pine prototype. 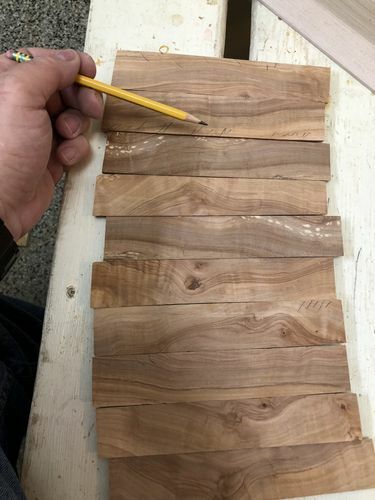 I had picked up a 1¼” by ¼” piece of pine, and that seemed like a good way to figure out exactly what I was going to do. 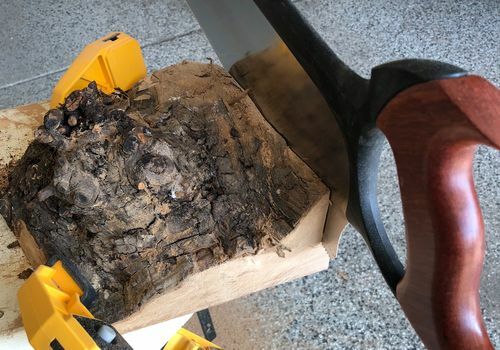 I started by tapering the pieces of pine. I looked at a stein in my cupboard, and for a 1 liter stein, it looked about an inch narrower at the top than the bottom. I figured that was a little more slant than I wanted to work with, so I decided that ten sides (a dozen pieces of apple, minus a screw-up or two), tapered by a quarter inch would give me two and a half inches, divided by 3 would mean the top would be about about ¾” smaller in diameter than the bottom, which seemed pretty good. 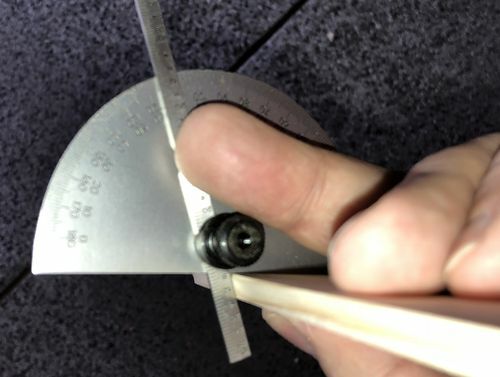 And since I’d decided on 10 sides, that meant 72 degree angles on the sides of the staves, so I set up a protractor. 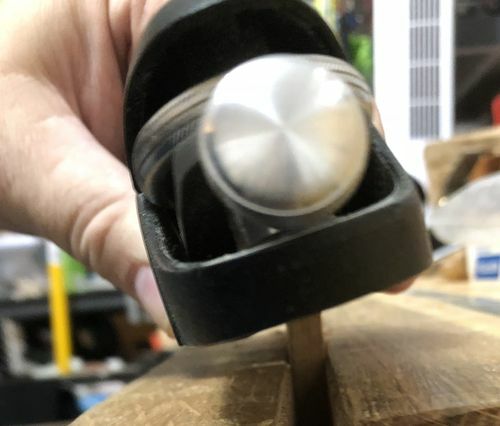 I did the tapering in both dimensions freehand with a block plane, but checked my work frequently as I went to make sure I was getting things right. 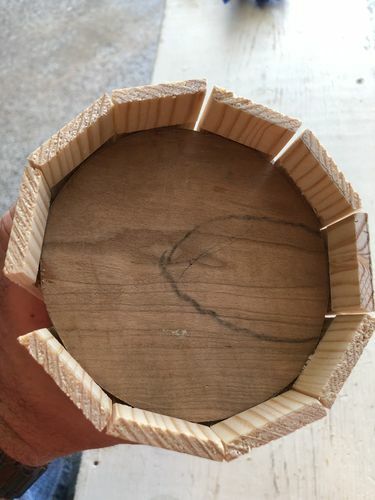 Once I got all the sides tapered, I cut out a circular piece of cherry from a 4/4 scrap I had laying around, then resawed it into two ⅜” round pieces. Taping the sides together with gaffer tape, I tested the fit and saw that I was close. 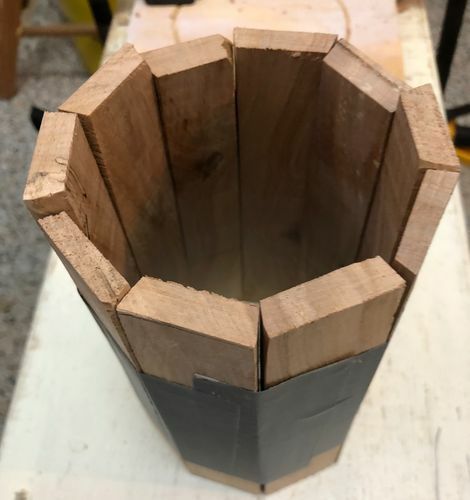 I cut a groove on the inside of the bottom of each of the staves for the bottom to ride in, then slowly took wood off the round bottom until everything fit pretty well. I also put holes in one of the staves to push dowels through to hold a handle on. 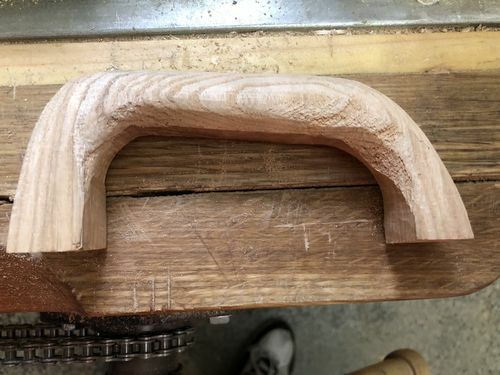 I was thinking that maybe I would carve round tenons onto the end of the handle, but it turned out to be much easier to clamp the stave and handle together then drill holes in both and push in a dowel, so I did that. I cut a couple handles from a scrap of elm I had, and shaped one with rasps, and the other with spokeshaves and knives. I would have rather made the handle entirely with edge tools, but the one finished with the rasps looked nicer, so that was the one for the swap-tankard. With the help of a few hose-clamps and gaffer tape, I tested everything one last time to see how I was doing. It didn’t look half bad. 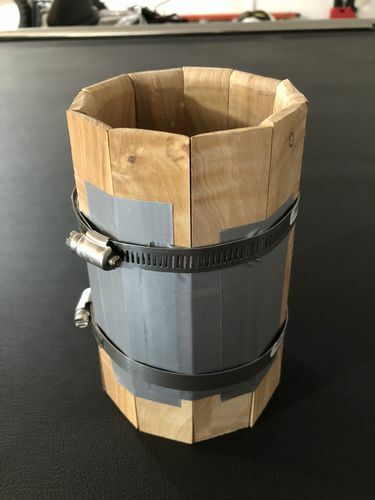 I used 14 gauge copper wire from the hardware store to wrap the tankard, and it was just strong enough to pull the staves reasonably tight before it snapped. I used a chain-saw file to make a small groove for the wire to ride in so it would be less likely to slip up the side of the tankard (remember the taper) while I was assembling things. I didn’t need that in the pine, since the wire could compress its own groove in that, but in the apple, I figured it would make life easier. That was enough experimentation, and it was time to get started on the apple tankard for the swap. 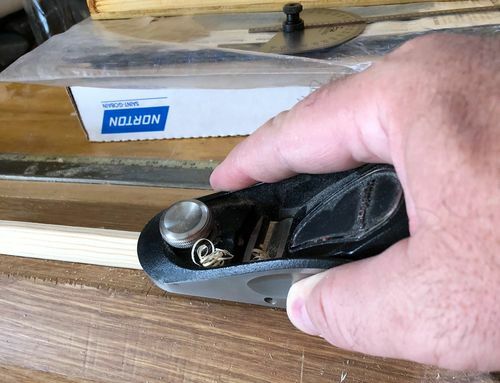 I went through the same steps, tapering the sides, cutting grooves on the inside, fitting it to the bottom, and realized that I would also need to plane the sides to a more consistent thickness. 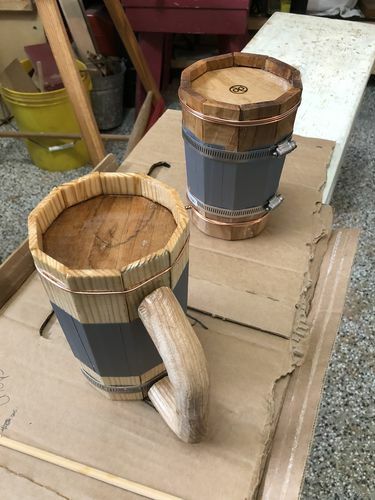 That hadn’t been an issue with the factory-made pine, but with my hand-cut apple staves, the varying thickness would lead to an uneven looking tankard. I also needed to round the inside of the staves before assembling them to make a nice-feeling top on the tankard. All that done, it was time for a test-assembly. Things were looking good. 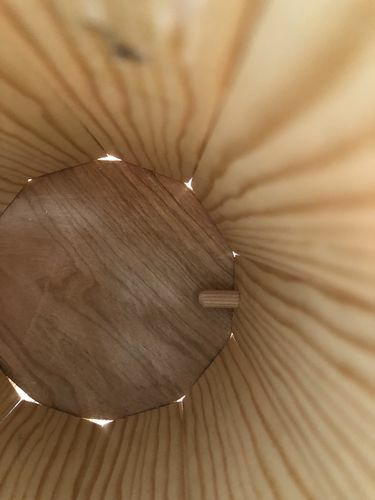 The last step was putting a coat of epoxy on the inside of the staves and bottom so I wouldn’t have to worry about getting a nice finish there after things were assembled. 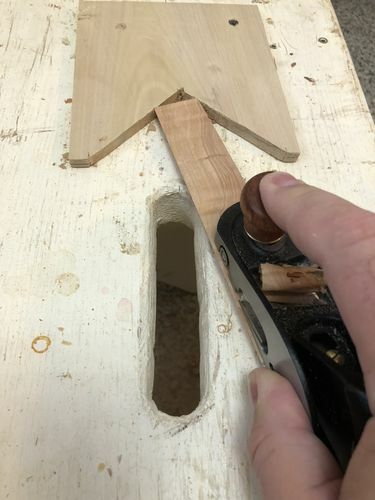 I also had glued the dowels into the stave that I picked as the “handle stave” and cut that flush, so the epoxy would help seal up any gaps around those dowels. It took three coats of epoxy to seal up the insides of the apple. There were just enough punky bits that it wouldn’t have held liquid very well without the epoxy, so I was really glad I’d done that before assembly, especially when the first coat almost entirely soaked into the wood. Once I had the insides coated, it was time for assembly. I hoped I would be able to get almost watertight without massive amounts of epoxy, but the fit around the bottom wasn’t great, and it took some sawdust and CA glue filler, plus another three coats of epoxy to seal up the bottom completely. With all the pieces together and a few coats of epoxy on the outside (I had initially thought of a varnish finish, but decided the epoxy looked pretty good), it was time to wrap it up. I shaped the outside of the top of the tankard with rasps and sandpaper, applied another two coats of epoxy, sanded lightly with some wet-dry 200 grit paper and put on a final coat and hoped no bugs would land in the wet epoxy (the brand I used has 30-minute open time, but isn’t gnat-safe until about 90 minutes – it’s fully cured after 36 hours). 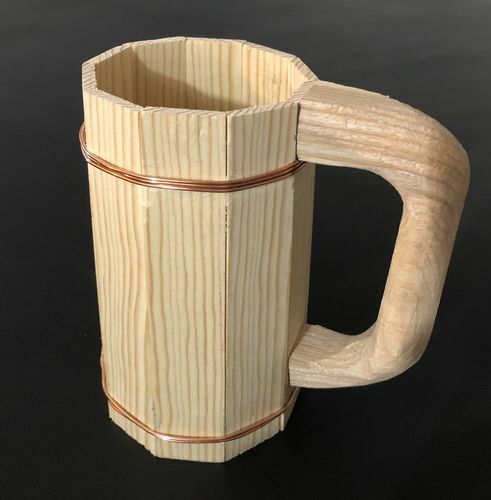 I think the finished tankard came out looking okay. Sweet Dave, nice work. 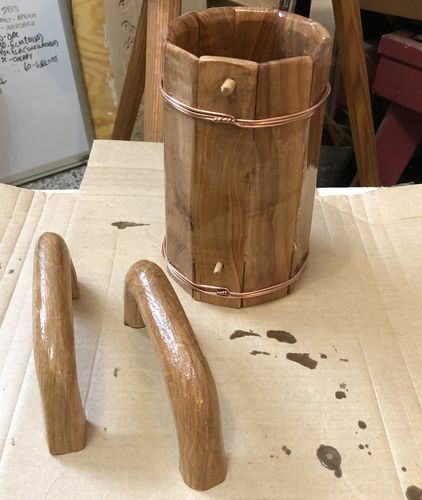 I’ve been wanting to make something with staves – bucket, pail, mug, but haven’t got to it yet, good for you in expanding your craftsmanship. Now, as Stumpy Nubbs says; sit back and have a cold one, you’ve earned it my friend. Thanks, Tom. It’s my first coopering, so here was a lot of learning going on since I started working on it in mid-July. If it hadn’t been for the beer swap I proabably wouldn’t have gotten around to it for a few more years. Dave, I’ve made a pen/pencil holder out of staves but haven’t had the courage to try anything like this. Thanks for the detailed description of your efforts…it just might get me to try one now! Tom, if the angles are mostly right, the bottom is the hardest part to fit. And as I did, you can always seal that with epoxy. The hose clamps were a huge help, as was the gaffer tape. But mostly it was a lot of test fittings and sticking with it until it was right. A very fine looking piece it is too! Hope the beer tastes good too. In NW America there are so many local breweries; I may not live long enough to cover 1/2 of them in a 100 mile radius of where I live. Excellent job on the tankard Dave. And all by hand! Being a “power tool cripple” I admire that. The text was quite informative also! The first beer (a saison from Ology Brewing in Tallahassee) I tried was good. Isn’t a chain saw a hand tool? ;) Great job on the tankard Dave! I can see how the bottom would be the hardest to fit. 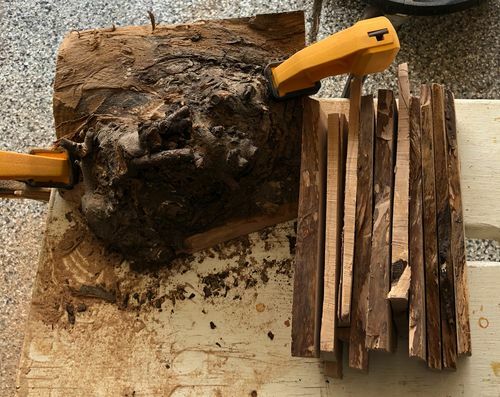 What if you used thicker staves and cut a deeper grove in them to fit the bottom? You could then plane down the outsides to thin it out toward the rim before clamping and gluing. Great write-up and nicely done sir! 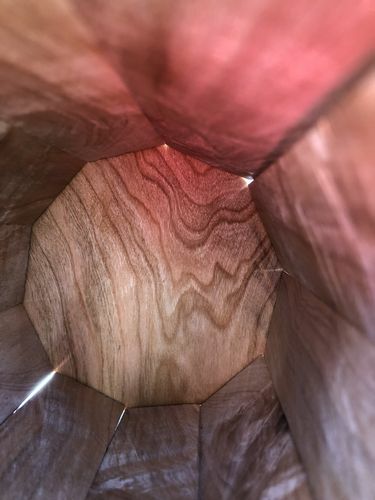 What if you used thicker staves and cut a deeper grove in them to fit the bottom? Thanks, Duck! The problem with the fit on the bottom was twofold. First, I cut a 3/8” groove, but by the time I had planed the bottom smooth, it was 5/16” or so. Gap! 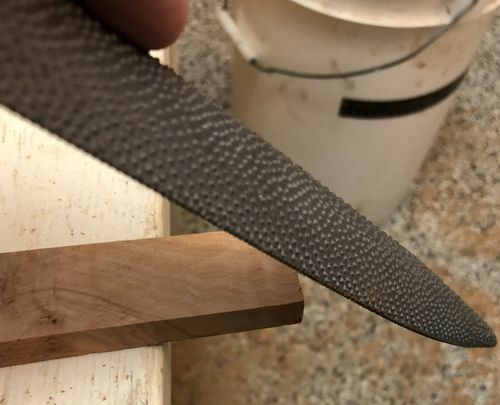 Second, I made the bottom round, and sides flattish, leaving gaps at the edge of each stave. I tried to round the grooves a little, but I should’ve just made the bottom 10-sided. But I didn’t glue the staves together. I tried to get them watertight without glue because I’m ambitious. I’ll either spend more time and really get them right next time, or just slather on the Titebond III and call it a day. Now there’s a project to build a thirst, and quench one, too. nice job! and particular thanks for the detailed description of the build. All around a great share. 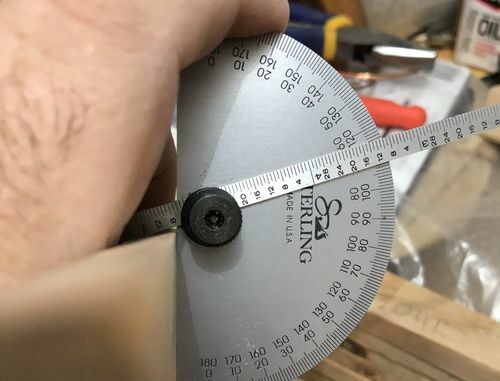 Excellent work for hand tools Dave. I think you will raise the bar on the beer swap. Thanks, Doug and Dave. We had some pretty good stuff this time in the beer swap. I’m in the top half, but Kenny’s mug, the Rich’s pecan coozies, and Mike’s opener were all pretty neat, too. I have to agree itlooks like all the elements for working up a good thirst! Hopefully the next one I do will come together a little more quickly. Resawing more accurately, so I spend less time tweaking the thickness of the staves would go a long way towards speeding the build. And some day I’d like to build one that goes together water tight without glue. Some day.